Mile Markers: Stop, Wash and Roll! I had two main goals on Monday. The first was to get warm and the second was to wash the nasty grime off of the BoggsMobile. By the help and grace of God, both goals were met. The sun took care of driving the cold away but the bus did not clean itself. The crud from the snow, slush, salt and sand had to come off. I waited until after lunch and decided if it was going to be done, I would have to do it. As I was preparing everything, we paused for a great lunch with Pastor Dennis King, Sis. Judy, Sis. Logan and Bro. Roger from the church. They are always so king to us at House of Prayer and we appreciate it so very much! When we returned from lunch, this was still staring me in the face. It is time to get to work, big boy. The picture below is during the wash process. It was like mowing the grass when it has been way too long between mowing. You might have to go over it a few times but at least you can easily tell which part has not been mowed/washed! It was so dirty that I had to wash the crud off the concrete when I was finished with the BoggsMobile. Now that is bad! Here is the warmth I told you about! It was windy, coming out of the south at 22 MPH but that is a heap better that minus 3 and 20 MPH wind coming out of the north like it was Saturday morning in Amber. 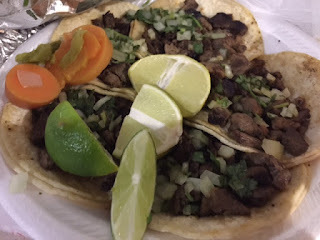 Monday evening we had tacos from the Tacqueria in Gainesville. So very good! Tuesday morning it was time to leave our friends in Gainesville and visit more friends and make new ones. We cranked the BoggsMobile and prepared to leave the House of Prayer. Here is the BoggsMobile with the Green Machine ready to push! We left the church, hopped on I-35 and drove south through the heart of Dallas. Normally we take the bypass around Dallas but we hit the traffic at the perfect time and zoomed right through town with no problem at all. 290 miles after we left, we were pulling into Livingston, Texas. Pastor Scott Morris is preaching revival at Beech Creek Assembly for Pastor Don Goodwin and we wanted to surprise Bro. Scott by dropping in for the Tuesday night service. I believe we pulled off the surprise and we received a great blessing from the service too! That is a pretty good deal, right? Here we are trying to be a blessing to our friends and God turns it around on us and blesses us. It was a great night! We dearly love Bro. and Sis. Goodwin and their family. It was very good to get to visit with them and to be in service with them too. Praise God that He has surrounded us with such great people. Every where we go, every where we look, we are blessed with the wonderful family of God. I do think we are going the right direction too. It was over 70 degrees Tuesday afternoon. I will take that any January day! Hallelujah!